My RSS reader consists of two screens - an initial list based on the entries from an RSS feed and a detail page for the actual blog entry. Here’s the initial screen. That’s a lot of text (partially because that blog entry really does have a lot of text at first) and not terribly nice looking, but it works. Now let’s take a look at the code. First off, the home page view, which is really just a list. Nothing too special here. You’ve got a list with a tap handler. On top you can see a call to loaded() for when the page loads. Now let’s look at the code behind this. So for the most part, this too is rather simple. Most of the logic is in a view module. This file basically handles asking the view model to do it’s thing and return a list of RSS entries. I do want to point out one thing. Notice in loadItem() I call a set operation. This is how I handle “I’m leaving this view but want to remember what I clicked.” This one thing took me roughly 70% of the development time for this project. Why? At first, I was creating an instance of my view model, not just requiring it. I did this on my detail page too. That meant when I set a value on it on the list page, I lost that when the object was recreated on the detail page. That seems trivial, but it took me forever to get around that. I also discovered later that you can pass random data to another view via navigate. You can see that described here in the docs. I didn’t see that at first because when I went to the API reference in the docs, I was initially on the “Module” for Frame and not the “Class” for it. I honestly don’t know the difference (I just asked on Slack though so hopefully I’ll get a clue ;). Now let’s look at the detail page. Again - fairly simple. I first used a TextView and of course that doesn’t render HTML. I did find odd performance issues with this control. The first few views worked perfect. Then I saw a noticeable lag in rendering the view. I’d say maybe 2-3 seconds. I’m fairly certain it is probably my code, but I’ve let me friends on the NativeScript code know about what I encountered. Ok, so now the code behind the view. Basically I ask for the data I saved in the previous view and update a local observable. I had tried to bind directly to my instance of RssListViewModel, but noticed that content only updated one time. Again - that’s possibly my fault. There’s two things missing from this app that I’d like to correct. First, a good mobile application should recognize when it is offline. I need to update the app to notice that, let the user know, and possibly start working again once network connectivity is restored. 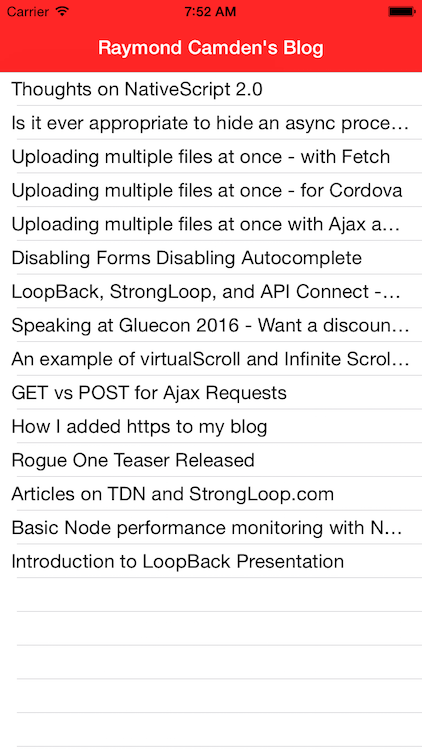 Secondly, many RSS feeds only contain a small portion of the entry text. 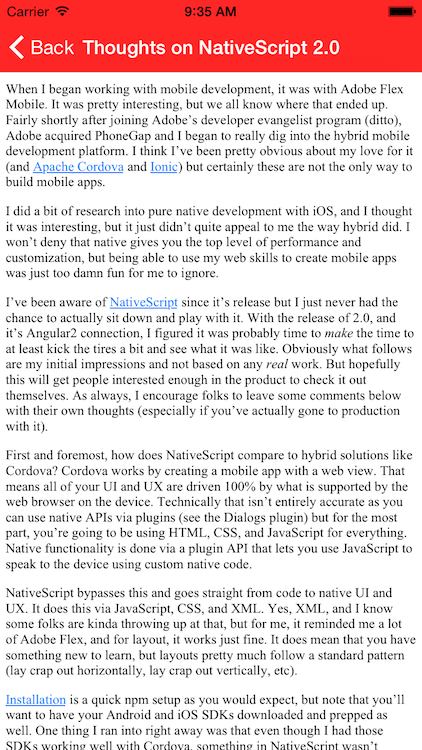 I’d like to add a button that would open the entry in the native browser for proper reading. Want the complete code? (And again, remember that it is code being written by a noob. I’d hate to be accused of leading people to bad code.) You can find the complete source here: https://github.com/cfjedimaster/NativeScriptDemos/tree/master/rssTest1.